Sign up to get access to my free resource library! I WANT ACCESS, SIGN ME UP! If you’re struggling to find more meaning in your life and feel like there’s a bigger difference you want to make, this training will shed light on the 3 keys that will help you discover your life purpose. If you feel the weight of the world on your shoulders and want to be more free, let this guide help you! It talks about the 7 mindset shifts you have to make to live more freely. ARE YOU LIVING LIFE TO YOUR OWN RHYTHM? In this 45 question, printable, yes or no quiz, discover if you are living a life true to yourself. You will answer thought-provoking, eye-opening, and insightful questions to learn more about yourself and where you are on the scale of living authentically. Find out how happy you are on a scale of 1-25 in this 25 question "agree or disagree" quiz. This quiz goes with the blog "3 Ways to be Truly Happy." 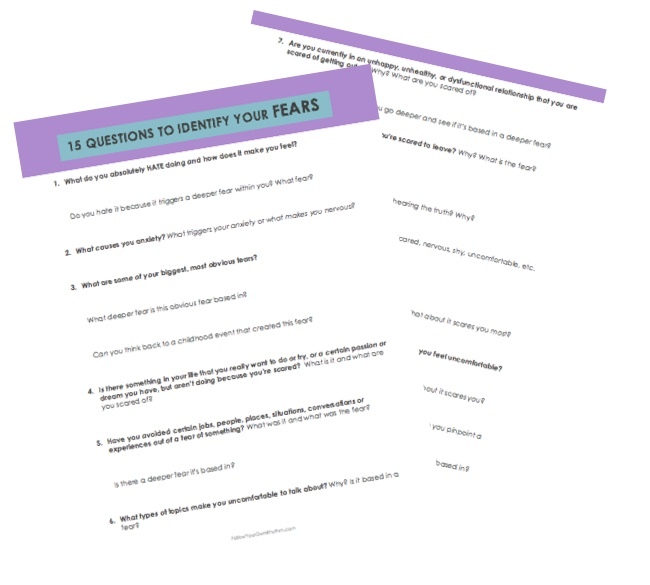 These 15 questions will help you tap into what your fears are so that you can bring them to the light, process them, and let them go. This worksheet will guide you to REDEFINE what success means to you so that the old paradigm of success can be replaced with your own authentic version. Also comes with a visualization exercise. These 25 questions will prompt you to get honest with yourself and build those "self-honesty and self-reflection muscles" so that you can catapult your personal growth. These 30 questions will be questions about how you respond to certain life situations. It's a great exercise for identifying patterns that you have that aren’t necessarily positive, healthy, or constructive. It will also prompt you to discover parts about yourself that you're not usually aware of. This worksheet will help you transform how you look at the things around you, what you have in your life, and life as a whole in 5 steps so that you can start to enjoy it more. 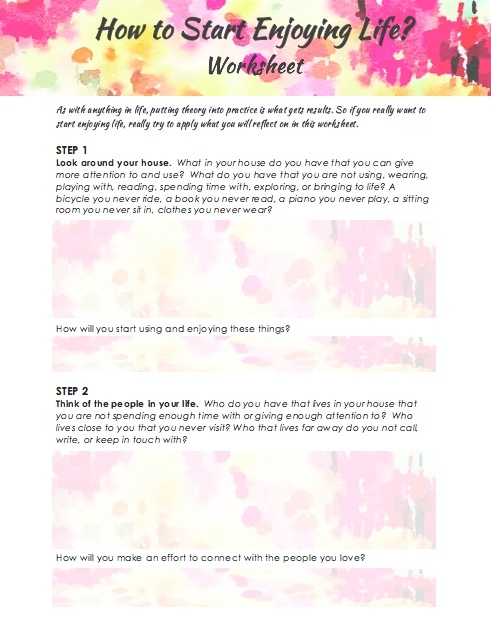 Read the 5 steps here. This guide will walk you through the steps that you can take to break free from your physical "cage" such as a bad life situation, an unhealthy relationship, an unfulfilling job, an addiction, etc. and prompt you to let go of the 3 limiting beliefs that are holding you back. If you are struggling with figuring out what you like to do, what you're good at, and what you should do with your life, then these 9 questions will help get your creative juices flowing so you can get a clue to what your passion is. This list of affirmations can be hung on your bathroom mirror, fridge, or wall near your desk to remind you of how great you are and to help boost your confidence. Read how to use these affirmations for optimal success here. This is a guided worksheet to help you process the painful emotions that arise in your life such as dealing with a loss, a heartbreak, a betrayal, or any type of emotional pain. The best thing you can do is to feel your feelings and process them fully. This worksheet will take you through the 8 step process of how to feel (and let go of) painful emotions. If you are constantly busy, rushing from one place to another, working crazy hours, and feeling unfulfilled in your life, in other words caught up in the rat race, this worksheet will guide you to find more meaning and ask you some questions to get you on the right path. This worksheet helps you identify what your values are and then align those values with specific actions that you can take so that you can live in accordance to your truth. Upon signing up, you will gain access to my FREE virtual library where you can view and print all of these PDF documents! LOOK OUT FOR MORE RESOURCES TO COME!